Experts say we should learn to love wasps if we don't want to be overrun with spiders and cockroaches. Researchers have revealed the best way to stop a swarm of wasps from invading your BBQs and picnics this summer and the solution? Trap the first one you see. Experts from Bristol University say the simple act of trapping the first wasp stops it from tasting the food, returning to the nest and recruiting more wasps to come and invade. It is thought the others sense food on the lone wasp and leave in search of the source hence why the buzzing creatures seem to multiply over time. “If you can just stop that first wasp getting back to the colony with food material then you have more of a chance,” stated Dr. Seirian Sumner, from the School of Biological Sciences at Bristol University and leading expert on wasps. It has also been found that despite always going for the sweet stuff on the table, wasps don’t feed their young with this type of food but rather other insects, showing that during late summer when their young are fully developed, they enjoy scavenging for sweeter treats. 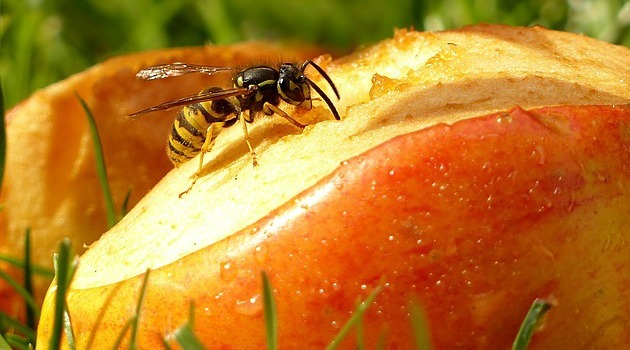 But wasps aren’t just pests at the picnic table, in fact they have been found to be crucial to our ecosystem eating up to 8kg of prey each summer season which amounts to roughly 14 million kg of insects in the UK a year. Sumner states that we should learn to love wasps because without them we would be overrun by other creepy crawlies like spiders and cockroaches. Next time a pesky wasp is lurking around your dessert, don’t kill it – trap it.